Helping communities is one of the strongest point of Unite The Union and recently the Unite Community Support Centre in Barnsley has recently joined forces with the British Red Cross. This week we have been able to welcome 6 Iranian Asylum seekers into the centre with the objective of assisting them with computer skills and helping them to improve their English. Within the next few weeks we are confident that we will be in a position to offer the ESOL (English for Speakers of Other Languages) course to them. We are looking forward to working with the British Red Cross new venture. Brian Clarke and myself attended this event on behalf of the Barnsley Unite Community Support Centre in order to observe just what UMWEP is doing, how it is progressing and to give us ideas for the development of the Barnsley Centre. Our first priority after registration was to introduce ourselves and to explain why we were here, we spoke very briefly with Carlos Cruz – ULR who was constantly being asked questions and dashing around from one room to another ensuring everything was going as planned, obviously a very good organiser, we also asked for permission to take photographs which we were given. 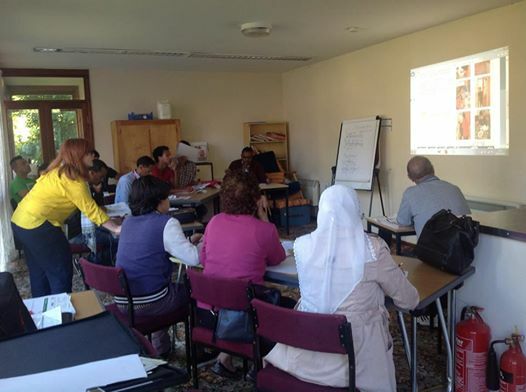 The first items on the days agenda were various workshops, having looked at the programme; we decided that the most appropriate workshop for us to attend was the ESOL On-line, as we are keen to offer this course in Barnsley. ESOL standing for English for Speakers of Other Languages. 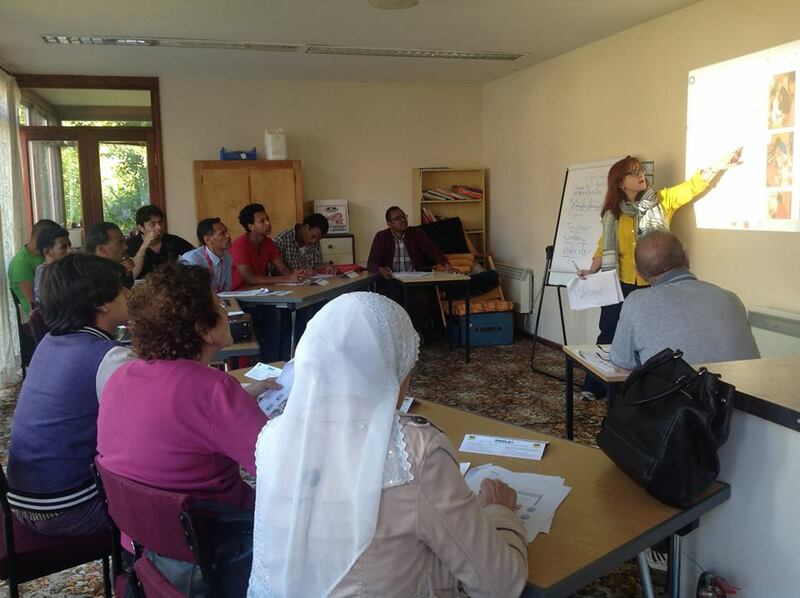 The tutor for this workshop was Orlando Martins, Regional Learning Organiser based in Norwich. We stayed in the workshop for two sessions listening to Orlando explain to participants what the course involved and what to expect from it. There were only the two sessions for this workshop and Orlando was kind enough to spend another 30 minutes or so explaining to us that he has been teaching this course since November last year he told us how he organises the courses the methods he has found most successful and of course he answered our many questions. Mohammad was keen to learn what qualifications Orlando had to deliver ESOL. Orlando gave the answer but explained that PTTLS was a good starting point and adequate to facilitate the course. It became apparent to Mo and me that this programme could work well in the Barnsley Centre but there are some resources that the Centre would require. We next spent some time in the Art workshop, not participating but observing what the students were doing and looking at their work. We took several photographs of art work on display. Next was the drama workshop where we watched what was taking place, unfortunately for us, in this workshop only Spanish was spoken so we had to guess what the students were doing by their actions rather than words. It appeared that they were re-enacting a scene where they as immigrant workers were being abused and even physically attacked. We then had the opportunity to speak with Lesley Stevenson, Equality, Diversity and Community Coordinator, a long-time friend of mine, Lesley explained the origins of UMWEP and its development to the present day and of the strengths of Carlos Cruz. Lunch was next on the programme which was very good with a mixture of Latin American foods on offer including Rice, Congrie (Black Beans) fried banana, fried pork, chicken, salad and a samosa type pasty with salsa with either orange or apple juice. Linda Hughes, Union Learning Organiser in our Region introduced herself (Mo had met her previously) and we chatted to her about the project. Click on Images to view the slide show ! After lunch everyone gathered in the auditorium, we were surprised just how many people there were present. A welcome was given by I think Steve Rowlatt, unfortunately the PA system was not working and my hearing is not good. Greetings from Len McClusky and Jim Mowatt were read out. This was followed by a contribution from Carlos Cruz, mainly in Spanish and a short film which featured Paul Robeson singing Joe Hill. During the contribution from Carlos he emphasised this project was not all about learning, it was also about organising, expressing the point that we cannot do much on our own as individuals but collectively in a trade union we can make changes and progress. Carlos also explained the situation and unfairness of Colombian Isabella Acevedo who was cleaner for Tory MP Mark Harper; he was reinstated as a junior minister after it was revealed that he had been employing Ms Acevedo illegally. Ms Acevedo has now been deported back to Colombia. He reported that UMWEP was now attended by people from 27 different nationalities, speaking 34 languages. (We had been told earlier that today the majority of people are from Latin America and the organisers are trying to encourage people of other Nationalities. Unfortunately at this stage we had to leave to catch our train back to Barnsley. Myself and Brian spoke at length on the train about what we had seen and heard and learned and how these ideas could be utilised in the Barnsley Centre.